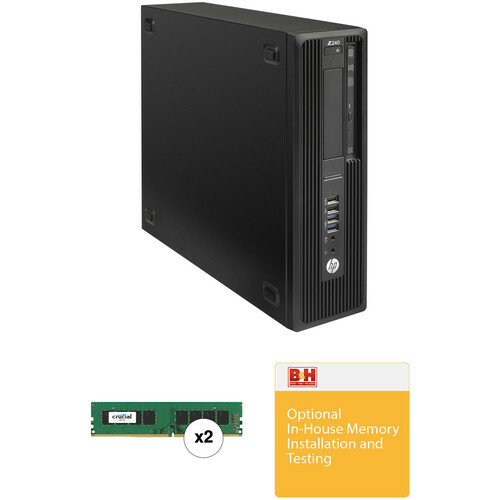 This B&H Custom Workstation combines the HP Z240 Series Small Form Factor Workstation with 32GB of 2400 MHz DDR4 RAM and B&H installation services. The 8GB DDR4 2400 MHz UDIMM Memory Module from Crucial is designed to help increase your desktop's multi-tasking capabilities with an additional 8GB of memory. This unbuffered, single ranked module uses just 1.2V of power and is compatible with systems featuring a 288-pin slot. Additionally, it runs at a 2400 MHz frequency (PC4-19200) with a CAS latency of 17. Crucial DDR4 memory debuts at 2133 MT/s, which is 30% faster than DDR3 memory technology. Crucial DDR4 increases the memory bandwidth by over 30% that of standard DDR3, so your system can handle more data at once. It also supports a four-channel design. This memory module uses 20% less voltage than DDR3 technology, operating at 1.2V compared to 1.5V for standard DDR3 server memory. Combined with the additional power-saving features inherent in DDR4 memory architecture, Crucial DDR4 memory is able to deliver up to 40% power savings compared to standard DDR3 technology. Box Dimensions (LxWxH) 6.7 x 1.8 x 0.9"